Consulting has changed. Speak to generations gone-by, and consulting sounded like the dream job: imagine all the good parts of consulting today (sitting in a room with a client, solving their most pressing problems) and take away the endless powerpoint and excel models! It seems a long way from today’s high-stress, long-hour environment. This partnered with the elongation of promotion cycles, and sometimes it’s hard to see exactly what drew you to the career. Well, my job today is to remind you. 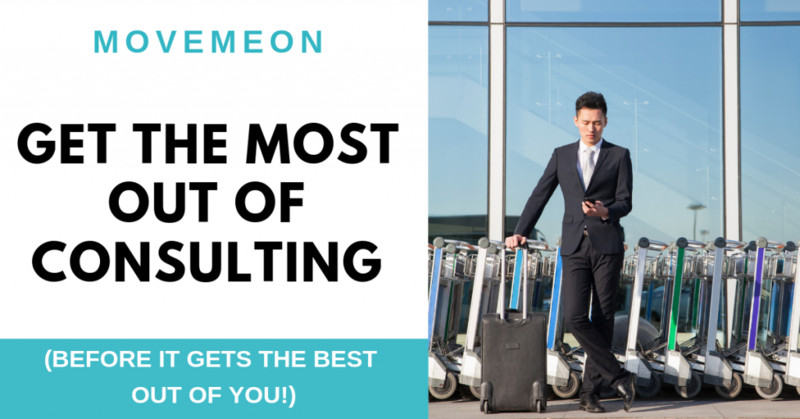 There are a lot of perks to a career in consulting; it’s just about making sure you get the most out of it! I look back very fondly on my McKinsey days. I worked with great people, travelled the world and learnt a lot – all in two very short years! However, given the opportunities on offer, if I had my time again, I’d make sure I got even more out of it. So, I thought I’d make a list of advice I wish I’d had during my consulting days, on how to get the most from consulting. The most important bit of advice: work with people you love. There are a lot of great people in consulting, but you’ve got to find the special few who you really get along with, and who also help you develop. Don’t let fate run its course: actively create a network of people you like and want to work with. Never miss the chance for an after-work beer, work social or away days / off sites. Don’t shy away from being outside of your comfort zone. We all have areas we are less confident in – consulting is very good at both finding these, and helping you develop them. As I mentioned in my last blog – getting the most from the development process – be clear on areas you want to improve and ask for advice. never forget to say thank you. They’ve got a really tough job, and are very rarely thanked given how much they put into it! Some of my most enjoyable projects were around the world – Hong Kong, New York, Middlesborough! It gets a lot harder to travel with work after consulting. So if travelling is something you like, and you’re in a position where you can travel without it affecting your life/ loved ones, do it! Make it very clear to staffing, and investigate the options (6-month placement; global rotation schemes etc.). If you don’t make it a priority, it won’t happen. Gym on site; amazing breakfast, lunch, dinner; team dinners and events; off sites. These are not normal perks – so for all of us outside of consulting, please, please, please make sure you make the most of them!